Manufacturers rely on chlorine bleach to whiten paper pulp and other materials during the production process. Chlorine bleach also plays an important role in wastewater treatment, and is used in many household cleaning products. Unfortunately, chlorine also poses a significant risk to the environment, and was even used as a chemical weapon during World War I. Many countries have banned chlorine bleach or restricted its use in an effort to protect the environment and human health. Manufacturers who use chlorine bleach often release it into local water bodies along with other liquid industrial waste. Once it reaches the water, chlorine reacts with other minerals and elements to form a host of dangerous toxins. These toxins, including dioxins, furams and PCDDs are often referred to as "persistent organic pollutants" because they linger in the water or soil and take many years to disappear. Greenpeace calls dioxin one of the most dangerous chemicals known to science, and warns that it can contribute to cancer, endocrine disorders and other serious health effects. The West Virginia University Extension also links chlorine-based compounds, like dioxins, with low sperm count, testicular cancer and breast cancer due to their ability to mimic human hormones. 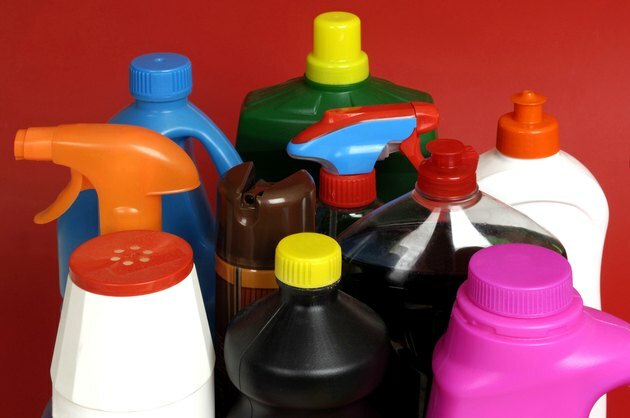 According to the West Virginia University Extension, by-products from chlorine bleach pose a significant risk to local wildlife populations, and have been linked to cancer in laboratory animals. Dioxins were responsible for the decimation of the bald eagle population during the mid-20th century, and continue to reduce the number of fish and bird species near the Great Lakes. The World Wildlife Fund also warns that these chlorine by-products can cause mutations, sterility and even extinction in wildlife species. One of the most significant problems with chlorine bleach is its persistence. Even low levels released into air and water supplies will accumulate over time, and may lead to long-term health concerns. West Virginia State University Extension points to the dangers of bio-magnification. First, microorganisms consume chlorine by-products in soil or water. These organisms serve as food for larger species, and as you continue up the food chain, each species is subject to an increasingly higher accumulation of toxins. Factories that rely on chlorine bleach also emit toxins into the air during the ventilation and exhaust processes. Some chlorine and related by-products remain in the air, where they contribute to air pollution. According to the Reach for Unbleached Foundation, these toxins can cause severe long- and short-term respiratory irritation upon inhalation. They may also contribute to problems with the immune system, blood and heart. Airborne chlorine bleach by-products eventually reach Earth's atmosphere and the ozone layer. According to Audubon Magazine, chlorine bleach is linked to ozone depletion, which has far-reaching environmental effects in terms of global warming.